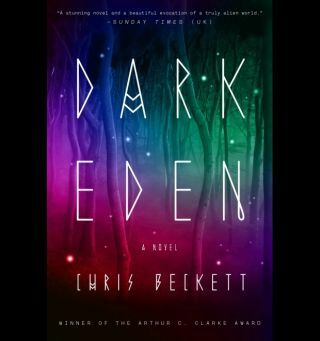 "Dark Eden," by Chris Beckett. Chris Beckett is a university lecturer living in Cambridge. His short stories have appeared in such publications as Interzone and Asimov’s and in numerous “year’s best” anthologies in the United States.contributed this article to Space.com's Expert Voices: Op-Ed & Insights. Readers of "Dark Eden" (Corvus, 2012) have noticed I played around with the English language a little in the novel. In doing so, I wanted to suggest the unique dialect that would undoubtedly evolve in a small community cut off from Earth for 160 years — it pleased some, and irritated others! I was impressed. I've lived in the same town for 30 years and would still struggle to accurately reproduce the local accent I hear around me every day, let alone sustain an accent that no one's ever spoken before. But I was certainly very happy to help. What would Eden English sound like? Our starting point was that everyone in Eden is descended from just two people — a white man from Brooklyn, N.Y., and a black woman from Peckham in South London — so one thing that we could be sure of was that the accent would bear traces of those two sources. But, of course, after 160 years, the accent of Eden wouldn't just be a mixture of London and New York. Language changes all the time. People play with it. Speakers get bored with saying things one way, and try another, much as people change their clothes. (Who could have predicted the trend towards a rising inflection at the end of a sentence in spoken English here on Earth, or the recent fashion of beginning sentences with the word "so"?) It only took decades for settlers in Australia to develop their own distinct version of English. And this dialect long ago ceased to be a mere blend of the accents of the country's British and Irish settlers, in spite of the continuing contact with and migration from the United Kingdom and Ireland. "Reduplication plays an important role in a child's acquisition of language behavior — it is one way for a child to demonstrate his intention to communicate and could have the specific purpose of triggering and maintaining the interaction, but also of intensifying or emphasizing the content of the utterance. That function is paralleled in adult language, as in English when we say, 'he's a big, big boy,' or in a more grammaticalized way in Yoruba 'mura kia kia' (to get prepared fast fast). "Reduplication is one of children's main simplification devices. The process is so dynamic that a lot of childhood reduplications have been introduced into the adult norms of the community in many languages ('dodo' in French, is 'derived' from the verb 'dormir' (to sleep) and may refer to a bed as well as sleeping). But reduplication has also been identified as one of the characteristics of motherese [which may in turn] induce more intentional reduplications in child language"
I've noticed myself that parents of small children, preoccupied as these moms and dads are with their new role, will often use baby talk even when speaking with one another. So I made the assumption, when developing the language of Eden, that this effect would be even more pronounced, and might become permanent, in the absence of other adults (or the written word, or TV) to pull the speech of family members back in the direction of adult norms. That explains the use of double adjectives for emphasis in Eden speech, which I hear with the first adjective emphasized and drawn out, with a slight fall at the end toward the lower, shorter repetition: "B-I-I-I-G big." But I think baby talk would also have affected the pronunciation and rhythms of Eden speech, making it slower, simpler and more singsong than terrestrial English. "What admirable patience!" Janet wrote of Jayne's work. "Over a period of six weeks, I asked her for multiple revisions, during which we fine tuned melodic tone, pace, double adjectives, chose certain text words to be voiced the Brooklyn way" — all the while collaborating with me. "Specific instructions were given to the rest of the cast, and director Bruce Mann was brilliant keeping everyone consistent during recording sessions." I feel rather honored that so much trouble went into the recording of my work. As part of this post to Space.com, this chapter of the "Dark Eden" text reveals more about the book.